As an objet d’art, Bug in a Vacuum is a thing of beauty. Its cover alone is arresting. The humorous title, along with the charming titular bug and vintage vacuum, are attractively embossed over a delightfully retro 50s style living room almost entirely rendered, remarkably, in various pleasant shades of green. Hooked at hello, the eager reader is next pleasantly surprised by Bug in a Vacuum’s unexpected heft. At ninety-six pages and over one and a half pounds, it is clearly aiming at something weightier than the typical picture book. 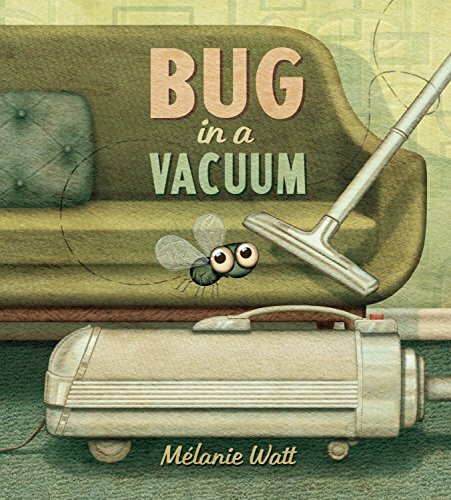 The creator is award-winning author/illustrator Mélanie Watt, who has had remarkable success exploring serious emotional issues packaged in superficially silly children’s stories. Her bestselling Scaredy Squirrel series, for example, is about developing the courage to reach beyond perceived limits. It seems the author has taken her own advice in that regard. In fact, one suspects that Ms. Watt may be the first children’s author ever to take on the task, as she does in Bug in Vacuum, of teaching elementary schoolers the essential elements of Elizabeth Kubler-Ross’ five stages of grief. With the crises established, we are taken through each of Kubler-Ross’ stages via gorgeously illustrated, wall-to-wall scenes reminiscent of Timothy Basil Ering’s gloriously exuberant Frog Belly Rat Bone (which also made use of just about every shade of green). Bug will pass through Kubler-Ross’ stages in loud, dramatic fashion, while the dog will do so silently. Folks grieve in different ways. At first Bug tells himself life in the vacuum is “amazing,” but eventually decides it must be a dream. Meanwhile the dog dreams of getting his toy back. Bug then attempts to bargain his way out of a situation it recognizes as undesirable. He offers no one in particular to clean up his act and stay away from windowsills, picnics, and porta-potties. The dog tries to trade a bone for his toy. Anger comes next. Colors darken and intensify to highlight Bug’s rage. The dog tries to bite the vacuum. Despair follows. Bug and the dog are hopeless and heartbroken. The stories come together when Bug accepts his fate by thanking the dog’s lost toy for listening to him share his feelings. The real dog gives up, heading off for food. And what of the ever important ever after? The vacuum’s cord frays, so it is put out with the trash. The dog follows the garbage truck for a bit—until he meets another dog (who looks just like him), and they become fast friends. And when the vacuum is dropped into the dump, it breaks open, setting our bug free to continue his life’s journey. And thus we can suss out the wisdom Ms. Watt has to impart on the subject of loss. Thankfully, the lesson here is not that Bad Things Happen for a Reason (a pernicious lesson to teach children if there ever was one). Nor is it that accepting loss is the magical key to undoing that loss. The dog never does get his toy back, but in moving on, a new and possibly greater opportunity presents itself. The final picture shows that his lost toy is someone else’s gain as well: a bird is using it to feather its nest. And Bug is also off, hopefully, to bigger and better things. All this is well and good. But someone has to acknowledge the elephant in the vacuum here: Do we need a book for the K-5 market about Elisabeth Kubler-Ross’ five stages of grief? But a need for adult intervention to navigate the intended audience through the book suggests that the ultimate value of Bug in a Vacuum will be primarily as bibliotherapy. The book will surely be sought out by psychologists, school counselors, and parents who have a need to comfort a grieving child in a gentle, clever, even fun way. Teachers of older students looking for an engaging method to introduce Kubler-Ross’ stages of grief will find it useful as well. And of course copies will also be Hoovered up by collectors who would never get over missing out on the latest gorgeously illustrated children’s book.